Moravian Glass Star Light Hanging Pendant - Partially Frosted - 15" Dia. 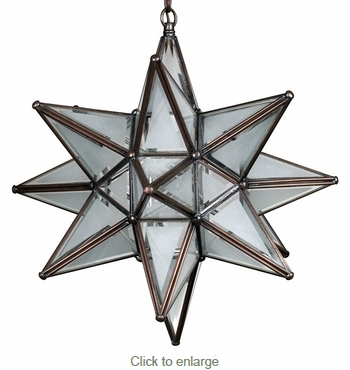 This tin and glass hanging star light with inset frosted triangle shapes on each pane will create elegant lighting to accent your rustic or southwest decor. This Moravian star looks great all the time, whether it is lit or not. All of our star lights are authentic creations handmade by artisans in Mexico.